Here is a great way to help you create those changes. Whether you choose the book(s) and/or the C.A.R.E. System your relationship will improve in no time. Check it out! 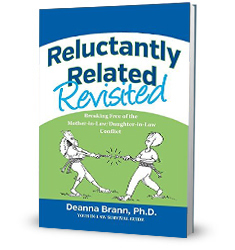 Reluctantly Related Revisited is the newest book from award-winning author Deanna Brann, Ph.D. With her trademark humor, compassion and years of experience, Dr. Brann explores the conflict that frequently arises in the mother-in-law (MIL)/daughter-in-law (DIL) relationship. Women everywhere know that the MIL/DIL relationship can be one of the most complex and difficult relationships they experience. Based on years of research and packed full of timely examples, Reluctantly Related Revisited highlights the issues and struggles created in the MIL/DIL relationship that add to the many disagreements frequently arising within families. 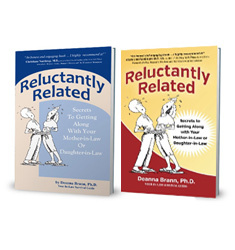 Including detailed action steps to overcome conflict and build a long-lasting healthy rapport with your in-law, Reluctantly Related Revisited is a must-read for women everywhere. Same great book with a whole new look! Change your struggling in-law relationship today! Through humor, compassion and focus, I’ll show you how, step-by-step. In my book, Reluctantly Related I give you the understanding and the tools to make positive, lasting changes in your mother-in-law or daughter-in-law relationship. You don’t have to feel powerless or hopeless in your relationship! Learn the secrets to making change possible. Learn practical yet effective tools and skills that build your confidence and empower you with both your in-law and others.. Learn how to transform your relationship without having to confront your in-law..
Mothers-in-Law & Daughters-in-Law Say the Darndest Things! 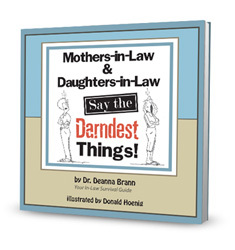 Dr. Deanna Brann is a leading expert in the area of mother-in-law/daughter-in-law relationships. 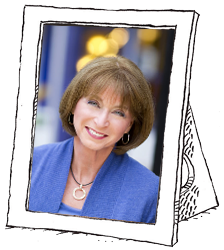 She works with women involved in this pivotal yet particularly challenging relationship, and has helped women nationwide to restore hope and bring healing to their families. Based in Knoxville, TN, Dr. Brann is a sought after speaker, author and seminar leader. Thanks to your book I now feel there’s hope for my MIL and me. We seemed to have this roller coaster kind of relationship. It was tolerable I guess but very tiring and I never knew what was going to happen next with her. The section on perception and reaction is what really turned things around for me. I had never really looked at why someone responded the way they did. This helped me see things from her perspective and that was an eye opener because it helped me see things so differently. Our relationship is definitely getting better and I’m so happy about that. I’ve always wanted her in my life and now I can. You’ve written a great book. It should be required reading for all newlyweds and their MILs. I was really at my wits end before reading your book. My DIL and I had no relationship and what made it worse was she rarely allowed me to see my grandkids. Your questionnaire was spot on when it came to describing my DIL! That’s what really turned things around for me. For the first time I understood her behavior toward me. I also knew I wasn’t crazy after all! But it was the tools that saved our relationship. I slowly started using the ones outlined for my DIL and WOW, what a difference a few changes made. She and I can be around each other much more comfortably. She is even letting the grandkids spend the night at our house. What a difference!